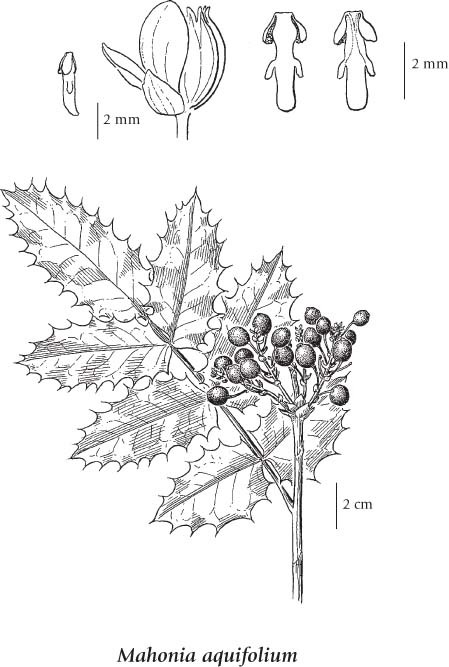 This lovely native evergreen shrub has thick dark green holly-like foliage on stems to about six feet tall. The buds begin to form in winter and open in early spring with bright clusters of yellow flowers. These are followed by deep blue ornamental fruits that mother robins feed to their young in my garden. The yellow pigment derived from the roots of this plant was used as a dye by First Nations peoples of British Columbia. Evergreen shrub from a rhizome; stems branched, stoloniferous to stiffly erect, 0.5-2.5 (4.5) m tall; bark and wood yellowish. Evergreen, hollylike, alternate, pinnate; leaflets usually 5-11, pinnately nerved, more than twice as long as broad, mostly with 12-29 prominent spiny teeth, shiny above but less so beneath. Inflorescence of clustered racemes 3-8 cm long; flowers yellow, the segments in 6's. Clustered berries 7-14 mm in diameter, blue, glaucous, with a few large seeds, edible. Mesic to dry open or closed forests in the lowland, steppe and montane zones; common in S BC; E to AB and S to ID and OR. A shade-tolerant/intolerant, submontane to montane, Western North American evergreen shrub distributed more in the Cordilleran than the Pacific region. Occurs predominantly in continental cool temperate and cool semiarid climates on very dry to moderately dry, nitrogen-medium soils; its occurrence increases with increasing summer drought and continentality. Sporadic in summer-dry mesothermal climates, common in open-canopy Douglas-fir forests in the coast-interior ecotone. Often associated with Agropyron spicatum, Calamagrostis rubescens, and Rhytidiadelphus triquetrus. Characteristic of moisture-deficient sites. The climate type for this species, as reported in the: "British Columbia plant species codes and selected attributes. Version 6 Database" (Meidinger et al. 2008), is cool temperate & cool semiarid.